Giovanni Savarese has coached a team into a championship match for the fourth straight season. Before the Revolution named Brad Friedel as their eighth head coach in 23 years, three former Revolution players were on their radar: Pat Noonan, Steve Ralston, and Giovanni Savarese. Noonan and Ralston, like Friedel, had no previous head coaching experience at the professional club level. 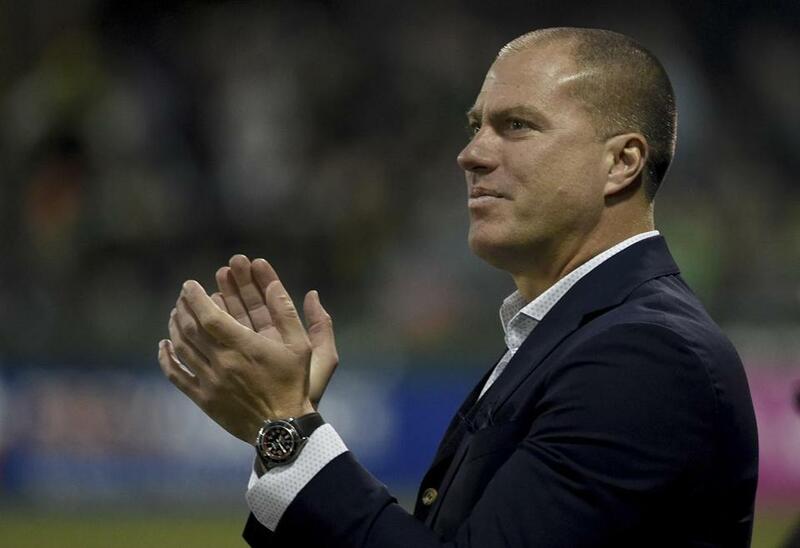 Savarese, though, had displayed a winning touch with the New York Cosmos. And he has gone on to guide the Portland Timbers to a date with Atlanta United in the MLS Cup final this Saturday. This will be Savarese’s fourth successive final; he led the Cosmos to the NASL Soccer Bowl from 2015-17. The Cosmos won three NASL titles in five years (2013, ’15, ’16) under Savarese and his top assistant, Carlos Llamosa. Savarese had not coached in MLS, but leading a top team in the NASL was probably the next-best thing for a domestic coach. Savarese played for the New York/New Jersey MetroStars from 1996-98. He scored 10 goals for the Revolution in the 1999 season, then went to Swansea City and led the team with 11 goals in the 2000-01 season. Savarese also performed in Italy and returned home to Venezuela before becoming a commentator for ESPN. In 2013, Savarese took over the Cosmos. The Savarese-Llamosa combination produced an effective style of play, and they were able to get the best out of local players as well as expensive imports such as Raul and Marcos Senna, and low-profile difference-makers such as Emmanuel Ledesma. Llamosa, who played for the Revolution from 2002-05, returned to Foxborough as part of Jay Heaps’s staff, but was fired after the 2017 season. The ’99 Revolution included several future coaches: Leonel Alvarez (Club Libertad), Walter Zenga (Venezia), Dan Calichman (Toronto FC assistant), John Harkes (Greenville Triumph), plus, in the collegiate ranks, Chaka Daley (Michigan), Kris Kelderman (Milwaukee), John Kerr (Duke), and Johnny Torres (Creighton). After Heaps’s firing, the Revolution also considered experienced coaches such as Bruce Arena before Friedel was named in early November 2017. The Revolution have a history of gambling by hiring first-time coaches: Zenga (1999), Fernando Clavijo (2000), Heaps (2012), and Friedel. Their most successful coach, Steve Nicol (2002-11), actually turned down their initial offer in 1999, believing he needed more experience. Gregg Berhalter, introduced as US national team coach Tuesday, has been among the few MLS coaches to emphasize a possession game in recent years. Berhalter mostly had success with the Columbus Crew, and though he did not win a championship, he set standards for playing style for the league. But Berhalter will not likely be able to insist on ball control with the US team, as MLS players’ tactical and technical levels remain low. Also, Berhalter will not have time to work with the team and will be confronting extreme conditions in regional competition. “CONCACAF is a completely different animal,” said Revolution all-time leading scorer Taylor Twellman, now an ESPN commentator. “Teams have had success by being very good defensively, putting teams under pressure. “You play in weird predicaments, fields are not that great, weather. You have to find a way to survive. You go to Guatemala and they’ve had torrential downpours and the grass is up to your ankles, do you push up your fullbacks? “But players tell me Gregg is meticulous and detail-oriented and good at executing a game plan. And Columbus has played direct and gotten a result. “But Gregg should’ve been there for the France game [June 9]. Gregg Berhalter is young and inexperienced at the international level. He should have [been given time] to figure things out and get his feet wet and ease into the process. US Soccer did not hire a full-time coach after Arena resigned in November 2017. The national team played 12 games under interim coach Dave Sarachan. Now, unless MLS can replace Berhalter, and find other coaches who will emphasize skillful play, the league will struggle to progress. The Revolution are still facing obstacles in their bid to build a soccer-specific stadium in Boston. But consciousness appears to have been raised, as the stadium was mentioned during a City Council hearing regarding the possible transfer of an 18-acre parcel last Thursday. The Kraft family likely would need to invest more than the $325 million it cost for Gillette Stadium (68,000 capacity), though the project would be much smaller in scale. The plan would be for a 20,000-seater with state-of-the-art amenities and a high-tech cantilevered roof that would contribute to a distinctive design. This would be the first significant open-air stadium constructed in Boston since 1912. The best attempt at establishing a stadium in Boston since Fenway Park might have been 5,000-capacity Lincoln Park, which played host to baseball, football, and soccer matches from 1931-37. Lincoln Park was located off Albany Street and Massachusetts Avenue, about a mile from the proposed Revolution site. There have been plenty of goals in the MLS playoffs. But if attacking play had been left to US players, that might not be the case. Out of 50 goals converted in 16 postseason matches, a total of seven have been scored by US-born players. Portland’s Paris-born Jeremy Ebobisse is among the few US-eligible attacking players to show promise in the postseason. Savarese has been patient with Ebobisse, who has been performing in a single-striker role that requires him to sacrifice as much as threaten to score. Ebobisse, 21, who likely will be the youngest starter in the MLS Cup final, played for Kerr at Duke and paired with Real Salt Lake’s Sebastian Saucedo on the US Under-20 national team. Ebobisse’s family has a New England connection: Jeremy’s older brother, Patrick, played for Williams College, reaching the NCAA Division 3 Final Four in 2009 and ’12.